The third edition of Insect Ecology: An Ecosystem Approach provides a modern perspective of insect ecology that integrates two approaches traditionally used to study insect ecology: evolutionary and ecosystem. This integration substantially broadens the scope of insect ecology and contributes to prediction and resolution of the effects of current environmental changes, as these affect and are affected by insects. 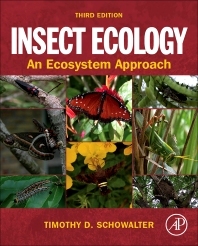 The third edition includes an updated and expanded synthesis of feedback and interactions between insects and their environment. This updated material and a new chapter on applications of insect ecology to social and environmental issues effectively demonstrates how evolutionary and ecosystem approaches complement each other, with the intent of stimulating further integration of these approaches in experiments that address insect roles in ecosystems. Effective management of ecosystem resources depends on evaluation of the complex, often complementary, effects of insects on ecosystem conditions, as well as insect responses to changing conditions. Timothy D. Schowalter received his Ph.D. degree in Entomology from the University of Georgia in 1979. Since 1981, he has been a professor of entomology at Oregon State University, Corvallis, studying the effects of environmental changes, including natural and anthropogenic disturbances, on arthropod communities in temperate and tropical ecosystems, and effects of herbivores and detritivores on primary production, carbon flux, biogeochemical cycling. From 1992-93, he served as Program Director for Integrative and Theoretical Ecology at the National Science Foundation, where he was involved in developing global change and terrestrial ecosystem research initiatives at the federal level. He served as a U.S. delegate to international conventions to develop collaboration between U.S. Long Term Ecological Research (LTER) sites and long term sites in Hungary and East Asia and the Pacific.